This interview took place on: 11/3/13. JFH (John DiBiase): When you did the new album, The Glorious Unfolding, did you approach it any differently than your previous records? Steven Curtis Chapman: Yeah, there was a fair amount of pressure, I would say, mostly within myself, but some from outside as well. And not like, "Man, you better deliver or else!" More just like "Man, it's been six or seven years since you've done what we call a 'studio record'"--just a regular record because, of course, Beauty Will Rise was a very specific record about losing Maria and there was no thought, at any point, of "is this relevant musically? How does this fit lyrically, musically, sonically, production-wise into the landscape, currently, of music?" All of that stuff. JFH (John): But it was a beautiful album! JFH (John): Especially since it's completely just from your heart and part of the healing process. Steven Curtis: Yeah! Right. It was just not even made to be a record. And then, there was re:creation, which was, in a similar way, definitely a step forwards/backwards toward what I had done traditionally, certainly with "Do Everything" and even "Long Way Home." Y'know, [it was] some sense of, "well, I wouldn't be opposed to something being fit for radio or being a radio single, so let me be attentive to that, but this isn't, again, a record that's designed to be my next big studio release to market. This is kind of something I need to do: go back, revisit these songs, kind of a best-of/greatest hits, but not really. Kind of a hybrid, sort of. And Americana--kind of make it all acoustic." It started out to be just, honestly, an acoustic sessions of me doing some of my hits and then it sort of evolved and grew a little bit more. So that was not a typical record release. And then there was the Christmas record, and then Deep Roots, which was a record I wanted to make my whole life -- bluegrass music, love it, folk music. Cracker Barrel came to me; we'd been talking for a few years about doing something together and, to be honest, the Christmas record started out as possibly a Cracker Barrel record. Cuz they had come to me and said, "What do you think about doing a record..."
Steven Curtis: Yeah! Yeah! They came to me and said, "We love what you do." There are some big fans of my music in the Cracker Barrel corporate offices. Actually, it's funny, one of the head guys there is a huge Caleb fan! I mean they love love Caleb. He's got kids that are big fans and he's become a fan. Caleb sang on the record because he was like, "You're going to have Caleb sing on the record, right?" It was so funny! So anyway, all that to say: when I started thinking about this record, it was the first time I had allowed myself to start getting a feel for what's going on currently in music and what parts of that would feel real natural and I can resonate with with what I would write--maybe how this record might sound, how I might produce it, so that it would sound like a current record. JFH (John): ..."What does Steven Curtis Chapman: 2013 sound like?" JFH (John): I think you captured that! Steven Curtis: Well that was important. Part of the reason why I wanted to make this record was because I really felt like I want people to feel as much as anything that our--and I say "our" ministry, because Mary Beth and my family have been such a big part of it--is for people to see God's keeping and healing work in our lives still at work. And the testimony that is, hopefully, to people to be able to say, "Man, whatever we're going through, here's an example to say 'God will carry us through this cuz we can look at this family, look at the Rick and Kay Warren's of the world who walk through these dark, dark places and yet can say "Blessed be the name of the Lord. He gives, He takes away."' But by His grace, we're healing, we're still carrying this, it's redefined us, it's not like we'll ever get over it, we've been changed forever by it. But what does that look like five years down the road and what can I communicate now that I could not have said five, six, seven years ago? I could not have written "The Glorious Unfolding" or "Finish What He Started"--so many of those songs, because they've come from that place of saying, y'know, "Life is nothing like I thought it was going to be, but can I believe that God really is going to finish what He's begun, that He is gonna make something beautiful out of all these broken pieces?" And I can say that from a place, now, of there's some real authenticity to those messages. I believe when I say that. So, lyrically and thematically, all of that, I pretty much knew going into it. Musically, sonically, that was where I kind of began to say, "man, there's a lot of music that I hear that I'm really excited about and I'm influenced by--from Mumford & Sons to Imagine Dragons, to Fun." There's stuff going on in music that I'm like "Ahh, yeah, I like that!" When I hear it, I kinda turn up the radio and go "That sounds cool!" What parts of that can I incorporate into the music I make that would feel natural? And so, I think, that's where we started with this record, just on the production side, almost saying "Let's do as much with the rhythms and build these songs with a lot of hand claps and foot stomps, before we even put drums on, just to kind of create a different sort of sonic foundation and a feel and where would that take the song?" So that was a kind of intentional thing. I'm hearing that in a lot of current music and it feels good, it feels right, it feels sort of corporate; it's got a corporate element where everybody's clapping along and the foot stomps and there's something real purposeful about it, like I'm making this declaration and marching forward with this, which seemed to be right for the whole theme of this glorious unfolding. We're moving forward and God's carrying us forward. So all of that felt like the right template for where to start with the music. And, of course, there's ballads and the song for Shaoey ("Only One and Only You") and the song for Mary Beth ("Together") and the song for my grandmother that passed away ("See You In A Little While"), a lot of that. So, I guess, answering the question, circling back around (*John laughs*) if I can, there was definitely a sense of wanting to explore some new ideas production-wise and sonically and musically, and yet still keep the heart and soul of the friend that so many people have come to listen to, and thankfully, I still have those friendships and relationships intact and people still want to hear what's going on. JFH (John): Absolutely. I remember when I heard the album This Moment for the first time, and I remember thinking "This feels like hearing from an old friend." Y'know what I mean? And it felt so good to hear that. So, in listening again to The Glorious Unfolding, my iPhone immediately played the next album after it finished, and it was Heaven in the Real World, which was my first Steven Curtis Chapman album that I heard when it was new. And I thought that this new album (The Glorious Unfolding) has a familiar but fresh sound. I think you captured that very well without sounding not like "Steven Curtis Chapman." And without sounding like "Eh, we heard this all before." Steven Curtis: Yeah! Good, good. Thanks! I think anthemic kind of music is something that I--I mean you can almost hear it from the very beginning of my music, but especially around For The Sake of the Call, and those records, and The Great Adventure, anthems that kind of make you want to stand on the mountaintop and go "Yeah! We're in the adventure! We're diving in! We're going to abandon it all for the sake of the call!" Steven Curtis: Yeah! Yeah! And then, for a while, it didn't feel like the right thing for a season, but this record I felt like "Yeah, I'm ready to make some of those anthemic kind of sounding songs again," because I'm ready to do that again. JFH (John): Where'd you get the idea for "The Glorious Unfolding?" --just that concept, and the even [using it as the album] title? Steven Curtis: I will say this about this record, I mentioned earlier that I was feeling pretty intimidated by this looming idea that "this is your first studio record after six years," and then marketing departments and record labels and management, they all put that in the press and people are going, "Well that's not true because you had all new songs on Beauty Will Rise! And you--"
JFH (John): *laughing* That's what I thought too! Steven Curtis: And I'm like "Guys, c'mon! Don't confuse people! Why did you have to say that?" But, y'know, I knew what they meant and they were trying to make a deal of "Hey! It's the first kind of 'back-to' the full spectrum of ballads and up-tempo and fun!" But I was intimidated by this thought that I really need to deliver this record and it needs to be all that people might expect it to be and that I would expect it to be, and it needs to be great! *laughs* It needs to be fresh yet familiar and not "sound like," y'know, but "sound enough like!" And there's no way you're going to please everyone. Somebody's gonna say "Aw man, it sounds all the same!" and somebody else is gonna go, "Man, it sounds so different!" JFH (John): It's totally true. So I felt like that, I knew, very definitely, that that was the theme that God was putting on my heart. And that it was this unfolding story and I kept going, "It's going to be incredible! It's an amazing unfolding. It's going to be"--and I don't usually use the word "glorious," but it's just that that was the word that came to mind. And, of course, I immediately went "Surely, somebody's used 'glorious unfolding,' I mean that sounds like it belongs together, y'know?" Kind of like "Magnificent Obsession," y'know? *laughs* And I love those words that you don't normally see together that make you go "huh?" So I just had that idea sort of come into my head. I had written several song ideas around the idea, like "This is only the beginning of the beginning" was one song I'd been working on. I had two or three songs that ended up being in that song ("Glorious Unfolding"), and they were different songs of "this is just the beginning," "we were made to run through the fields of forever" that just [stated the idea] that this is not the end of the story--even though it may feel like it. And more and more, I've obviously thought more about Heaven in the last five years than I ever have before, and I think that it was more and more that idea that this life seems, on some days, so long--"Long Way Home," y'know? *chuckles*, those thoughts--but that it is just the very beginning of the very beginning of eternity of what God has. And that's what's carried us. That's what's kept us moving forward on a lot of these days. That this is not the end. One message that came to me, right after we lost Maria, from Greg Laurie--and it, ironically was just about a month before his son was killed in a car wreck--he sent me a message and said, "I just want to encourage you to remember Maria is a far greater part of your future than she is of your past." And that was, of all the many things people were saying--well-intentioned and truthful things, it just was so hard to hear anything at that point--but that was just one that was like "Yes! I can hold on to that!" There's this story that's unfolding and this is a hard chapter right now. So the theme of that was very clear to me from the beginning. So I just began to take another step and another step--as the song says--in that direction. And as I did, it was literally like, almost as I held that basket up and said, "Alright God, I'm kind of terrified of this, cuz there's so much expectation that I'm feeling--putting on myself about this record being fresh and new and great and all the things my old records, the best ones, were--and even more because it's a new record, yadda yadda yadda! I gotta give all that to You and just offer up what I have and start the process." And then God really started to--y'know, the song ideas started to come and I did end up writing a lot more than I needed but felt like I had what I really needed to communicate. Steven Curtis: Yeah! And then back to the old problem of going "Well, I gotta do that one! I gotta do that one!" *laughing* Yeah, such is life I guess. JFH (John): Now, do you feel like some of the songs -- do you write them as kind of encouragement to yourself? Like when you sing it and hear it, it kind of strengthens you? Steven Curtis: Yeah, absolutely! I heard Laura [Story] say the other day from stage that all these songs we write, these are not truths that we have mastered and then therefore now we are ready to share them with you from our place of great wisdom and conquering this, they're all written from--as I've often said, I feel like every song [I've written] I have the word "wanna" in there somewhere. I've overused that word so many times because I feel like all these songs are like "God, this is what I want to be true of my life. I'm writing this from a place of 'this is what I desire, this is what I want to believe. Help my unbelief. I believe it, help my unbelief." So all of those are written from that place of "for me," y'know, I'm reminding myself, I'm reminding my family, my wife, that this is going to be a glorious unfolding, that we gotta keep taking the next step even when it's dark. Because it's not like we're "over" this or we've come through it. You don't ever come through losing a child or losing any of the loss that we experience in our life. We carry that all the way to Heaven with us--that broken heart, broken parts of our story. That's why it matters so much that God says, "I am working all these things together for good. You're not going to see it completely realized until Heaven. Will you trust Me, will you trust that this promise is true." So for sure, these songs--this was a very healing process for me as much as it will be an encouragement to anybody who hears it. Every one of the songs are me reminding myself of these truths, which is why I write them. JFH (John): Y'know, it's funny. I interviewed Crowder at this church a couple of years ago. And he sings about joy a lot, and I asked him "Do you ever have those days when you feel like you have to fight for joy?" And he was like, "[Actually...] I think I'm a pretty bleak person." and he said "It's sort of the idea of the black spirituals. They would sing about this place they wanted to be. And they'd almost sing themselves into it - is sort of how I look at that." JFH (John): And I thought, "Wow, that changes everything about how I look at it." Because as music listeners, especially when you're young and you're listening to music, everybody [you listen to] seems like they have it all figured out. If they're singing about it, they've got it figured out! JFH (John): Or your horse broke its leg and got shot. JFH (John): It gets frustrating. Steven Curtis: It can be frustrating. JFH (John): Especially if you're a perfectionist. You grow up thinking "Well, when I become an adult, apparently I'll know everything!" JFH (John): And you get older, you're like "When am I going to know stuff?? When's this all going to make sense?" Steven Curtis: *laughing* "When's all this going to come together?" JFH (John): But that's encouraging -- that mindset the it's something God put in us to long for Heaven, because you're here and you're like "Alright, everyone else seems to have it figured out, even the guys behind the pulpit seem to have it all figured out." And then you realize some of them don't and you wonder "Well, how could you preach that? And you don't have it figured out!" And it gets really frustrating. Steven Curtis: Yeah! Yeah! "So were you just winging it? Were you faking it?" Y'know? JFH (John): *laughs* "Why are you telling us to do that?" Steven Curtis: *laughs* Yeah! Which is what I love! Like, if we look at scripture, and even I think--my tendency is to even read it through a lens--like when David is in the Psalms, saying "How long, Lord? How long?" Until we went through what we went through five years ago, I didn't really see the reality of what David, the Psalms, are doing where in the same breath, he's saying "How long, God? Where are You?! I'm dying! I'm sinking in the quicksand, it's gone over my head, I'm dyin', I'm goin' down. Fine! I guess You're just going to let me die!... But Your love is better than life!" Y'know? It's like "WHAT?! Are you schizophrenic?!" And I realize "yes he is!" because it's like he's holding on to what's true, but he's pouring his heart out to God and he's saying, "What I feel, what I see in my circumstances, there's no way I'm going to survive this! But--" then it's like he'll grab ahold of himself and say, "Wait a minute, soul, why are you so downcast within me? Hope in God! Trust in God! Believe His promises again." That's reality. That's what the faith journey actually looks like. JFH (John): Totally. Definitely. I'm learning that... Do you have a favorite moment on the album? JFH (John): Right! It's "beautifully chaotic." Steven Curtis: Yeah! And it just stays that through the whole song and it just felt like that's right cuz it's not finished, cuz the song is saying "God will finish what He started," but it feels so purposeful, so much like "We are going somewhere, we're definitely not sitting still!" It never sorta settles in to something. And, I dunno, I just love that about the way that song felt, and the vocals and just everything about it. So that's one of my favorite musical moments. I love the song I wrote for Shaoey, "Only One and Only You." And "Together." Both of those I didn't play--Mary Beth didn't know I'd written a song for her and Shaoey didn't know I'd written a song for her, until they were all finished and recorded so I could sit them down and give them the real, full presentation. That was a special moment, just to sit Shaoey down. She had heard--actually, I'd been talking to Mary Beth about it. She told Shaoey, "Hey, did you know Dad wrote a song for you?" Steven Curtis: *laughs* Yeah I know! She gave it away! But it was cool, cuz Shaoey had heard and then Mary Beth is at home sayin', "I don't think I was supposed to tell you that, so don't tell Dad until he tells ya." So she knew kind of what was going on. And then I finally got to play it [for her], that was just so special. She cried and just thanked me for it. And then the song "Together," that I wrote for Mary Beth, I sat her in my studio. I actually recorded this record in my studio I'd just finished like a week before we started the record, as part of the renovation that was going on at our home. So there's this kind of rebuilding in our own lives and in our hearts and there's this new studio that's a new chapter. So a lot of it was very significant to the new sound, even the sound of all the hand claps and the foot stomps and all that. We ended up doing all that in a room in my studio that we didn't even design to be a recording room. It was a lounge but nothing was in there, and it's got this tin on the walls, kind of an industrial looking treatment that we did. And it turns out that it was like the perfect room for all these gang yells and vocals and hand claps and stomps because it's a real bright, live room. Even the drums sounded amazing in there. We put 'em in and turned the mikes on in that room and it was like, man, it sounds so big, just this big expanse. So just things like that that were kind of parts of the whole sound of it that felt very new and fresh. JFH (John): That's awesome. And now that you have your own studio, you can make more music! Steven Curtis: Yes! Yeah! (*John laughs*) In fact, that's where my daughter-in-law, Jillian Edwards, just finished her new album. She just finished a CD that's amazing. She is amazing. She has two or three EP's on iTunes under singer/songwriter. Little six, seven-song EP's. She's just got the coolest voice. She just finished a new [solo] CD, and then her and Caleb and Will have actually done a thing called The In-Laws together. So they're doing a few things. They're doing a few shows with Drew Holcomb & The Neighbors and they do some stuff together. Caleb didn't get to work on their new CD [at my place], because it was under construction at the time, but now he's doing an EP in interim while they're introducing the new [Colony House name], getting the record deal all figured out. I think he's going to release a little 4-song EP of new music under the Colony House name. Yeah! I'm excited to get to do new music. I'd love to make another Deep Roots, Volume 2 at some point, because that was such a fun record to make. So who knows what all I might get into in the next few years. It'd be sweet to get to get in there and create. JFH (John): One last question: Have you ever thought what song you might sing when you meet Him face to face? Steven Curtis: Hmm. Well, people will often ask the question, "What's your favorite song? ", which is always like "There's no way to answer that!" but I often say, "If I could only sing one song, what would that be?" and I've always, for whatever reason, gone to "My Redeemer is Faithful and True." And that's why I redid it on the Deep Roots CD. I just feel like if I had one last breath, you got the mike one more time, you've got three minutes *chuckles*, what's it going to be? That would be the song, because it's just what is true--and what I hope all of my songs communicate. God is faithful and He's true to his promises. Now, obviously, when I see Him face to face, I can't imagine singing anything (*John laughs*) or saying anything. Steven Curtis: Yeah, "Speechless." There ya go! You answered it for me! That's it! I will sing "Speechless," only in fact I will BE speechless! *laughter* For the first time in my life! *laughing* And God will say, "Yeah, I know better than that! You always got something to say, Chapman! Go ahead, let it out!" No... but, I can't imagine. I think it will be--y'know, I've often heard people say that the first sound you will hear in Heaven will be this corporate "OHHHH!!" *laughter* Like "Wow! That's what you were doing! That's what was going on!" So I'm sure it will be a combination of that and it'll be obviously be seeing Maria's face and it'll just be some version of "Thank you." Y'know? "Thank you for Your love and Your faithfulness." But now you'll have me thinking of that question and I'll kinda be going "What would that be?" Probably about an hour from now, go "YEAH! (*John laughs*) That's what it is! That's what I shoulda said!" Steven Curtis: Yeah! Y'know, it's funny when you say that, because--and I may think about this later and go "No, I'm gonna retract that"--I do think a lot Heaven and I even talk about it--man, how awesome it's gonna be! The worship when we're there and when we're in Heaven and we get to just be in the presence of Jesus and we're singing 'Blessed Be Your Name' and all these worship songs that--I didn't write, that I just love to participate in--and we're singing Psalms and "Holy Holy Holy" and we finally "get it." It'll be those that I think that I'll probably be [singing]. Y'know, "It is Well with My Soul." I mean, can you imagine singing that--finally--in Heaven?? And I think that's funny, because I think most of my songs are written from a place of longing and waiting and hoping for that day that, it's almost like, when that day finally comes and I'm finally there, so many of my songs will be washed into this hoping and longing and waiting is over and it's realized. It's almost like many of my songs won't even be necessary, in a way, anymore. Which isn't sad to me to think about, it'll be the final, full realization where they'll all kinda melt into this one "Finally!" Which is a pretty awesome, incredible thing! Y'know what? I think it'll finally be able to sing "It is Well with My Soul" and just fully mean it and get it and know it and experience it. But that's a cool thought, that's a cool question. 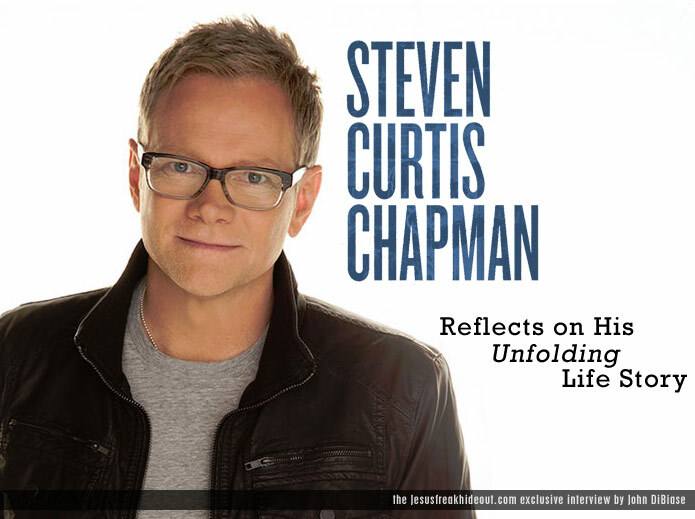 Steven Curtis Chapman's latest album, The Glorious Unfolding is available now wherever music is sold!